‘Gully Boy’ Ranveer Singh made a huge announcement today. The actor in collaboration with filmmaker-musician Navzar Eranee launched his independent music label IncInk. Under this label, the actor will discover, nurture and promote talent from across the country. Ranveer is naturally quite excited as well as nervous since his label will be launching its first music video ‘Zeher’ today. 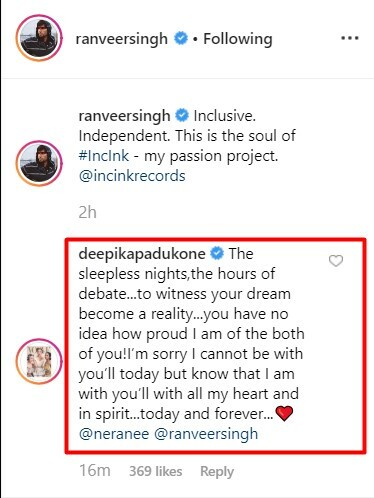 Now Ranveer’s wifey Deepika Padukone is busy with her first home-production ‘Chhapaak’ and hence couldn’t be with him on this big day. The actress wished Ranveer and his boys all the best and apologized for not being able to be with them today. Aww..that’s so sweet. Isn’t it? Well, we look forward to being introduced to new talents discovered by IncInk.